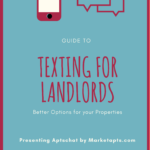 Why Use AptsChat.com Texting’s SMS Marketing Service? 98% of text messages are read within 3 minutes, and texts have 7X the response rate of emails! Not only will your contacts see more of your marketing, but they’ll also respond to it faster. When you connect to clients where they are, you create lasting and strong relationships. Reach out to more clients, and stay in touch with current ones. You’ll marvel at how fast your business will grow! We believe in providing quality service, while saving you money. The thought behind Apts Chat is a better way to do business, both for your time and for your wallet. Because of this, you’ll find our prices to be affordable, and our services to be invaluable. 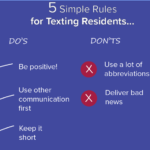 Text messaging boasts 10X the open rate of email marketing! With this kind of exposure, you’re sure to be heard. Learn more about how to use AptsChat.com! Learn more about our pricing options! Learn more about how AptsChat.com! Copyrights © 2017 aptschat.com | All rights reserved.